Humboldt State University has evolved over the last 100 years – and particularly over the last decade – into an institution known for high quality academic programs, strong values related to sustainability and social justice, hands-on learning, and a strong connection with our unique place. Now, as we begin our second century, we have a plan in place to build on those strengths to offer an even better experience for our students. This Strategic Plan will guide our efforts in the coming years. 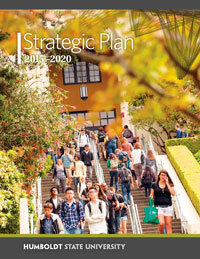 The Strategic Plan was developed throughout the 2014-15 academic year. During that time, the University community engaged in broad-based discussions about priorities, goals, and concrete steps that could be taken to help HSU better fulfill its mission. There were large planning sessions, small-group meetings, online submission of ideas, gatherings that involved communities off campus, and more. Our shared commitment and focus is vital for this plan to show results. On this site, you can provide your feedback and ideas, find ways to get involved, read updates about progress, and more. The strategic planning project board shows the status of several projects, across the campus, that support our ongoing implementation of the strategic plan. The design is based on a tried and true project management methodology ( Learn More about Kanban/visual project management )and emphasizes transparency, accountability and flexibility – all of which are important aspects for our strategic Plan implementation. Get a detailed description of the board (pdf).